Location: The “RING” hotel is located at the bank of “Augusta” dam and offers quietness, clean air and beautiful nature. The hotel is located just 2000 meters from the administrative center of Montana city. The hotel offers an amazing panorama to the north–western part of “STARA PLANINA”, Com, Copren and Mijur peaks, all of them higher than 2000 meters. The natural phenomenon Belogradtchik rocks, nominated for a new natural world wonder, two of the biggest caves on the Balkans, Magura and Ledenika, are at less than one hour ride by car from the hotel. The hotel offers restaurant, panoramic bar and fitness center. Free cable and wireless internet on the territory of the hotel are available. The people with disabilities have full access in the restaurant, the panoramic bar and the hotel part. “RING” restaurant can welcome up to 90 guests in an indoor hall and additional 40 guests in the summer garden. Guests of the hotel can enjoy European and Bulgarian dishes and rich choice of Bulgarian, Italian and Chilean wines as well. Panorama bar: The panorama “SKY” bar offers a two leveled hall with 40 seats and a terrace with 20 seats. 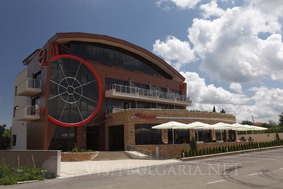 The bar offers unique architectural and design decisions and unforgettable view to “STARA PLANINA” mountain, Montana city and “AUGUSTA” lake makes it a perfect place for relax. Fitness centre: For the good shape of our guests we offer a hall provided with the standard room fitness devices, sauna and tangential bath-tub. The terrain around “AUGUSTA” lake offers good opportunities for “Cross country” cycling, five high class mountain bikes are at free disposal of our guests.